Valentina Moretti is our exclusive designer of unique and beautiful Murano Glass jewelry. She offers a little more romantic style to her "works of art". Her style is similar to Alessandro's as they used to work side by side. Now, she has her own design studio using only the finest Murano Glass and Venetian Beads in a feminine style. Each designer item below is custom made to your specifications when ordered, and therefore are not returnable. 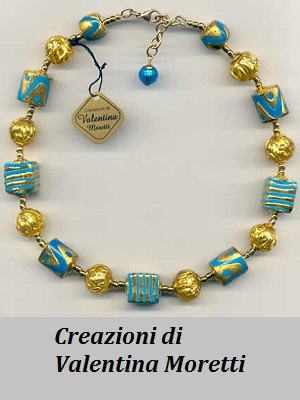 We, at www.VenetianBeads.com, aka Alexander-Lee Gallery, are the exclusive dealers for "Valentina Moretti" in America.